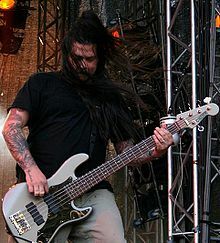 I was saddened to hear of the passing yesterday of longtime Deftones bassist Chi Cheng. He had been struggling with recovery since a horrific automobile accident in November of 2008. Chi leaves behind a wife and a son. Chi was a practicing Buddhist, and maintained an interest in Taoism and Shamanism. This entry was posted in Bassists, Classic Metal, Classic Rock, Heavy metal, Internet Radio, Metal, Music, Rock, Rock N' Roll, RockStar, Surrealist, Tattoos, Wornstar Clothing and tagged Abe Cunningham, Chi Cheng, Chino Moreno, Deftones, Frank Delgado, Hard Rock, Heavy Metal, Metal, Music, Rock, Rock N' Roll, Rock Star, RockStar, Sergio Vega, Stephen Carpenter, the Hellion, the Hellion Rocks. Bookmark the permalink.